VMware is well positioned at the intersection of major industry trends, including virtualization, containerization cloud, SDN, hyperconverged infrastructure, application security, and AI, said company CEO Pat Gelsinger, kicking off the annual VMworld conference in Las Vegas and marking the 20th anniversary of the Palo Alto, California based firm. The VMware Vision is to become "the essential, ubiquitous digital foundation for any device, any application, and any cloud. Gelsinger said NSX, which is its SDN network virtualization and security platform, is now enabling 80 million switch ports installed by over 7,500 customers, including 82% of the Fortune 100 with NSX running in their network. VMware estimates this footprint at 10X its largest competitor. Gelsinger argues that this positions NSX as the best platform to address the complexity, security and scale of multi-cloud corporate environments and for containerized networking. The latest version of NSX extends multi-cloud networking and security capabilities to AWS, in addition to Microsoft Azure and on-premises environments. NSX is adding support for bare metal hosts, in addition to hypervisor and container environments, including Linux-based workloads running on bare-metal servers, as well as containers running on bare-metal servers without a hypervisor. VMware showcased a collaboration with Arista which enables NSX security policies to be enforced natively on Arista switches across a multi-cloud enterprise, extending security policies across both virtual to physical workloads, from mainframes to data center to public clouds. The collaboration also integrates Arista’s Macro-Segmentation Services with VMware NSX micro-segmentation capabilities. VMware's vSAN, which is a hyper-converged, software-defined storage (SDS) product, is likewise making strong inroads into software-defined data centers. The company claims over 15,000 customers, a 50% presence in Global 2000 enterprises, and a 37% market share. The partnership with Amazon is growing. Earlier, the company announced that VMware Cloud on AWS is now available in Amazon Web Services’ (AWS) Asia-Pacific (Sydney) region. AWS CEO Andy Jassy appeared on-stage at VMworld to announced that new VMware Cloud + AWS solutions will be arriving soon for GovCloud, the Amazon initiative for secure government cloud infrastructure. AWS and VMware are also developing new NSX + AWS DirectConnect networking connectivity options. Amazon Web Services and VMware announced Amazon Relational Database Service (Amazon RDS) on VMware. This service will make it easy for customers to set up, operate, and scale databases in VMware-based software-defined data centers and hybrid environments and to migrate them to AWS or VMware Cloud on AWS. VMware agreed to acquire CloudHealth Technologies, a start-up based in Boston. Financial terms were not disclosed. CloudHealth Technologies delivers a cloud operations platform across AWS, Microsoft Azure and Google Cloud. It claims 1,300 customers. VMware will now support live migration of virtual machines using Nvidia Quadro vDWS vGPUs. Operators can move a guest to another compatible host while performing maintenance on the original server. Vodacom launched a standards-based, commercial 5G service in Lesotho, the landlocked kingdom encircled by South Africa. Vodacom's 5G service is delivering Fixed-Wireless Access broadband services to two enterprise customers in Lesotho. The service uses 3.5GHz spectrum. 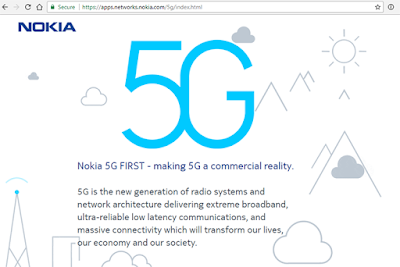 Vodacom said it has deployed the same standards-based 5G technology in South Africa, where it reports speeds in excess of 700 Mbps and latencies of less than 10 milliseconds. The carrier expects to boost the downlink to 1 Gbps or more as new software versions and devices become available. Until such time as 3.5GHz spectrum becomes available to Vodacom South Africa, this network will not be available to its customers. Shameel Joosub, Vodacom Group Chief Executive Officer, says: “Vodacom prides itself on being a market leader and we are extremely pleased to be first to deliver 5G services to customers in Africa. What we’ve accomplished in Lesotho is an example of what can be achieved in Africa, should the requisite spectrum also be made available. Vodacom South Africa has been granted a temporary spectrum license of 100MHz in the 3.5GHz band to showcase the same standards-based 5G network capabilities in South Africa. 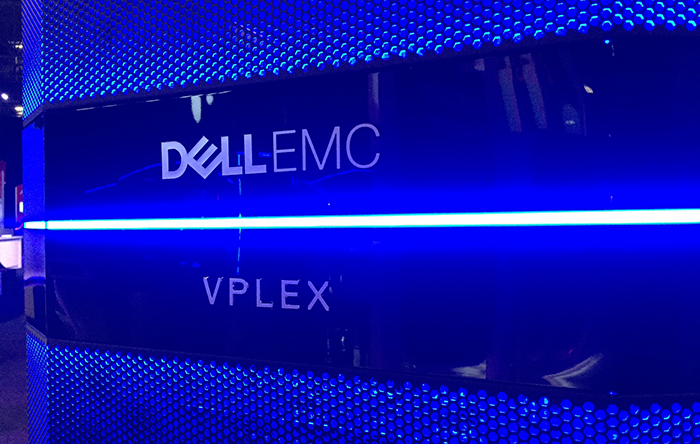 In conjunction with VMworld in Las Vegas, Dell EMC announced several enhancements to its cloud-enabled infrastructure solutions portfolio. Improved data storage utilization by way of tight integration with Virtustream Storage Cloud and Dell EMC Elastic Cloud Storage. Dell EMC Data Domain Cloud DR has been enhanced for application-consistent cloud disaster recovery in AWS, as well as recovery to VMware Cloud on AWS. Dell EMC Cloud Snapshot Manager noe provides backup and recovery for public cloud workloads, and now offers protection for Microsoft Azure. VMware vCloud Director features a new data protection extension that now enables cloud service providers to offer an integrated VMware and Data Protection self-service solution to customers. "As more applications and traditional workloads move into various clouds, the proliferation of cloud siloes will become inevitable, inhibiting organizations' ability to fully exploit business differentiators like data analytics and burgeoning AI initiatives," said Sam Grocott, senior vice president at Dell EMC. 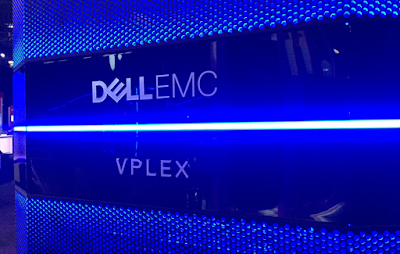 "Dell EMC's focused innovation across its cloud-enabled portfolio of platforms, infrastructure, consumption models and services helps organizations evolve more quickly to a cloud operating model for the modern data center." 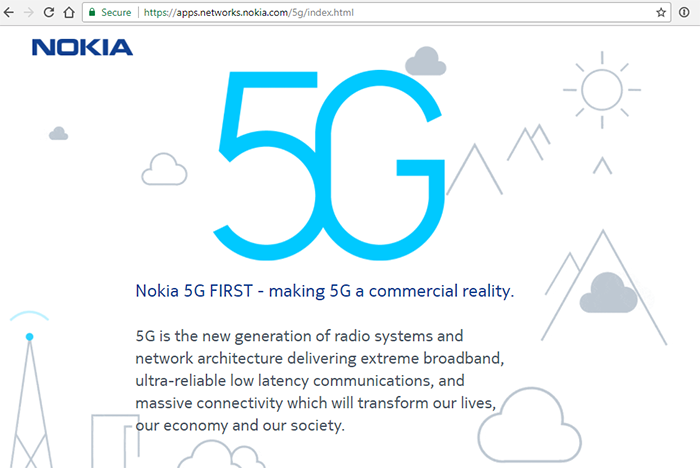 The European Investment Bank (EIB) will provide an EUR 500 million loan to Nokia for supporting its ongoing 5G research program. The EIB loan is supported by the European Fund for Strategic Investments (EFSI), a key element of the Investment Plan for Europe, also known as the Juncker Plan. GLOBALFOUNDRIES announced a strategic shift away from 7nm process technology and toward "clients in high-growth markets." Specifically, GF's 7nm FinFET program is on hold indefinitely and the company will shift development resources to make its 14/12nm FinFET platform more relevant, with a focus on new features such RF, embedded memory, and low power. The company announced a workforce reduction in conjunction with this move, although a number of top technologists will be redeployed on 14/12nm FinFET derivatives and other differentiated offerings. GF also announced plans to establish its ASIC business as a wholly-owned subsidiary, independent from the foundry business. AMD, which is "betting big" on the 7nm process node, confirmed that it will focus the breadth of its upcoming 7nm product portfolio on TSMC’s fabrication facilities. AMD said it makes sense to align its 7nm development closely with each of its foundry partner’s investments. It will continue to work with Global Foundries with their 14nm and 12nm technologies at their New York fab, which supports the ongoing ramp of AMD Ryzen, AMD Radeon and AMD EPYC processors. AMD said it has already taped out multiple 7nm products at TSMC, including its first 7nm GPU planned to launch later this year and its first 7nm server CPU, which is expected to launch in 2019. 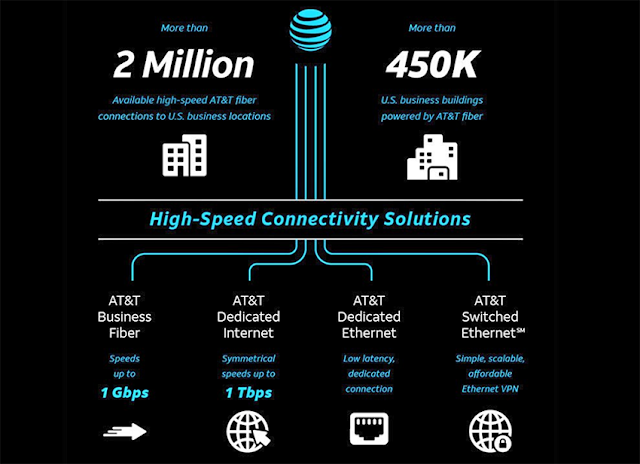 AT&T announced a milestone for its expanding national fiber footprint: more than 450,000 U.S. business buildings lit with, enabling high-speed fiber connections to more than 2 million U.S. business customer locations. 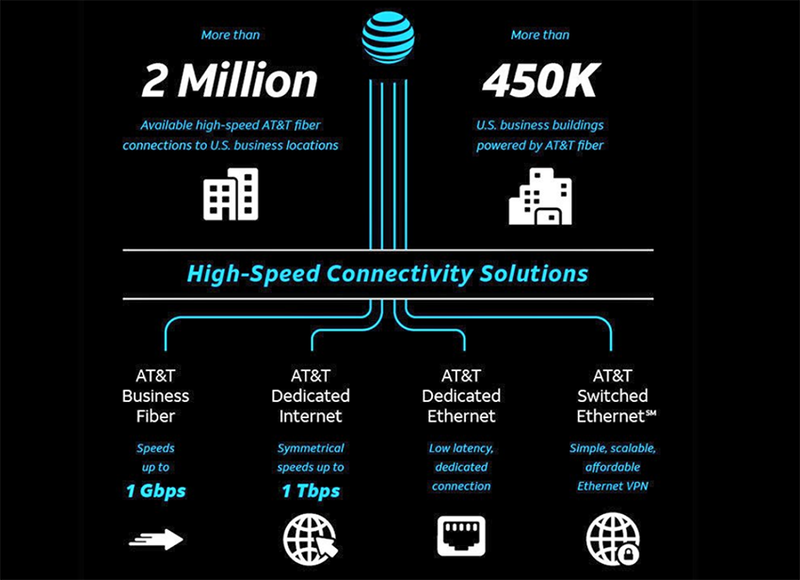 AT&T is bringing fiber to about 1,000 more business buildings per month. Nationwide, more than 8 million business customer locations are on or within 1,000 feet of AT&T fiber. Hawaiki Submarine Cable has selected TE SubCom to provide backup Network Operations Center (B-NOC) services for its transpacific cable systems. The B-NOC will operate from TE SubCom’s Eatontown, NJ, USA headquarters. SubCom said its NOC solutions are vendor-neutral and offer global, 24x7x365 monitoring coverage with both high-level and regional visibility into network status. 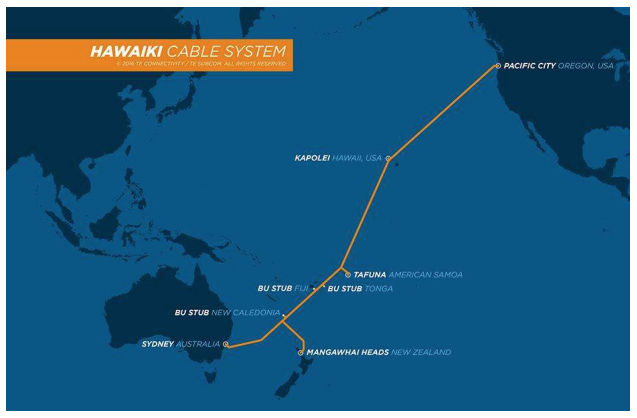 The Hawaiki Cable System is a 15,000km fiber optic cable connecting Sydney, Australia; Mangawhai Heads, New Zealand; Tafuna, American Samoa; Kapolei, Hawaii, USA; and Pacific City, Oregon, USA. Stubbed branching units have been installed to facilitate future connections into New Caledonia, Fiji, and Tonga. The Hawaiki system uses TE SubCom's optical add/drop multiplexing (OADM) nodes allows for additional landings in the Pacific region to be added as needed. Hawaiki will provide 43 Tbps of new capacity in the Pacific region. The system was built at a cost of US$300 million. Anchor customers on the new cable include Amazon Web Services, Vodafone, American Samoa Telecommunications Authority (ASTCA) and Research and Education Advanced Network New Zealand (REANNZ). OVH Group, the largest European hosting provider, appointed Michel Paulin as its new CEO, replacing founder Octave Klaba, who will continue to serve as chairman. Paulin previously served as CEO of Neuf Cegetel, for which he led the IPO, Méditel (now Orange Maroc) and SFR. 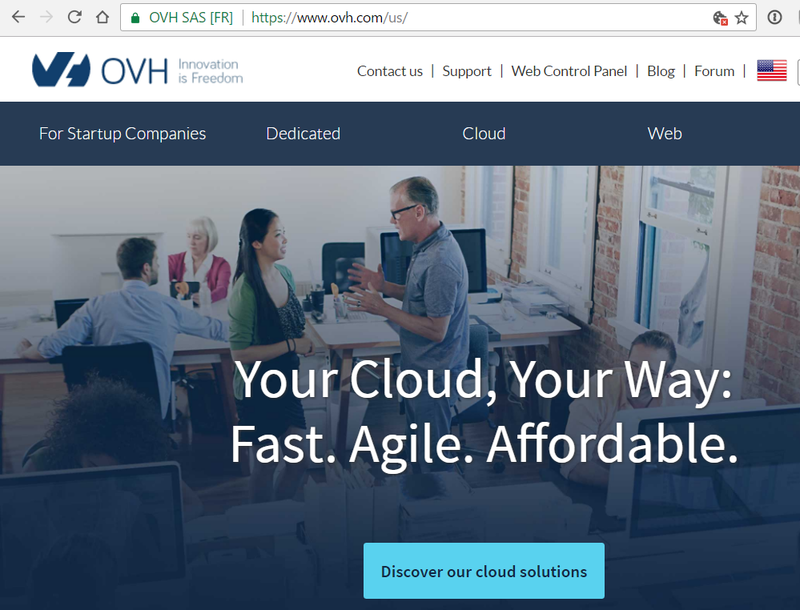 OVH said Paulin's nomination comes as the company embarks on a new “Smart Cloud” strategic plan, which aims to consolidate OVH’s role as an alternative leader in Cloud. NEC announced an equity investment in Tascent, a start-up based in Los Gatos, California, that offers a biometric identification based on iris scanning. Tascent's technologies include optical control technology to remotely capture an accurate, high-quality iris image at high speed, and a user interface (UI) technology that smoothly guides users in support of capturing accurate biometric information. The technology is embedded in security systems used at airports, government agencies and enterprises. The company was founded in 2015. NEC said its investment and partnership will enable the two companies to jointly enhance the capacity of iris recognition, using Tascent’s optical control and UI technologies and NEC’s advanced biometric engines, and create a next generation iris authentication offering for the public safety market.